The Misericordia University Soyka Artist-in-Residence and Soyka Fund for the Humanities are offering to take people on a musical journey when musicians and educators John Maurer and Nate Petley present, ?Music Through Time,?? on Friday, April 26 at 6 p.m. in Lemmond Theater in Walsh Hall. The Back Mountain Jazz Series? 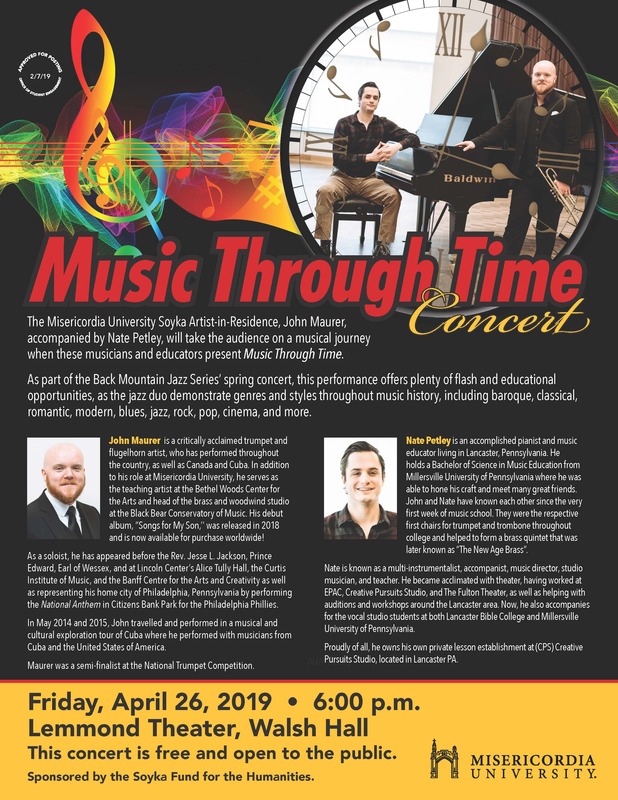 spring concert offers plenty of flash and educational opportunities, as the jazz duo demonstrate genres and styles throughout music history, including baroque, classical, romantic, modern, blues, jazz, rock, pop, cinema and more. The concert is free and open to the public. It is sponsored by the Soyka Fund for the Humanities.